In the latest edition of ABB’s corporate magazine ‘Utblick’ an article tells the story about our joint venture at Rosendals Trädgård in Stockholm. The same story was published at the ABB website and we´re happy to share it here with our readers. At Rosendals Trädgård our Big Hanna model T-240 turns garden and food waste into useful and fertilising soil ever since its installation in 2012. ABB delivered its Pluto safety system which we integrated with the machine prior to delivery and installation on site. Since then Big Hanna has become an important part of the gardens recycling system and gardener Niklas Karlsson almost sees “her” as a colleague. The full story is so far only available in swedish but we are happy to share the full english version translated by ABB below. Big Hanna, the composting machine, is the center of a recycling system where food waste is converted into compost and helps reduce greenhouse gas emissions. This means that Big Hanna improves the quality of the air we breathe. Niklas Karlsson, head of the kitchen garden at Rosendals Trädgård, is standing at one end of a large machine. He runs his right hand through the soil in a container, lifts a fistful and then releases it through his fingers. “This is fantastic compost. You can rely on her. She makes our job so much easier,” Karlsson says when he lays his soily hand on one of the hatches as if giving her a gentle pat. She is Big Hanna, a composting machine that was installed at Rosendals Trädgård three years ago. “Obviously she is a machine, but she is only using mechanics to boost a natural process. Big Hanna is my own special cow. She composts our food waste in four steps over two months, just like a cow with its four stomachs,” Karlsson says. Here at Rosendals Trädgård, a model T-240 Big Hanna Composter has become an important part of recycling on site. Rosendals Trädgård farms biodynamically and they have now closed the circle, as Karlsson phrases it. “The food people enjoy in the restaurant this year comes from the food people enjoyed here last year, or at least food left over from the year before,” he says. “Precisely. We wouldn’t be able to do what we have been wanting to do without Big Hanna. The process is now much quicker thanks to Big Hanna but it is still very much a natural and organic process,” adds Karlsson. He pushes up his beanie hat, leans on a spade by one of the composter bins some way from Big Hanna and beams in a way only a man who loves composters more than anything else in the world can do. “Before Big Hanna, it took twelve months to get good compost. Now it’s ready in half that time,” he says. It all starts with food waste. This comes from the restaurant and bakery at Rosendals Trädgård, where nothing is allowed to be thrown away. Even though the Big Hanna T-240 Composter is packed with advanced technology and mechanics plus safety sensors from ABB that ensures it is safe and secure to work with, the process itself is very close to nature’s own composting process and actually pretty simple. In with the old at one end. Out with the new at the other end. 100 kilos of food waste is transformed into around ten to 20 kg of compost. Containers of food waste are emptied into a container where the waste is ground and mixed with pellets. This mix is then passed into Big Hanna where it makes its way through the four “stomachs” or stages over a three to four week period. The four stages are a kind of rumination, except the end product is soil that is mixed with sawdust. A kind of pre-compost rather than manure. However, proper manure is also required. So when this pre-compost is transferred to the compost area at Rosendals Trädgård, it is mixed with natural dung from the horses, cows and boars from Skansen, the next door neighbor on Djurgården. Six months later, Niklas Karlsson and Tin-Tin Jersild and their team have a soil improver that is as far from artificial fertilizers and chemicals as possible. The cycle has been completed. Karlsson returns to the subject of “her”. To his Big Hanna. Big Hanna was invented by sociologist Torsten Hultin in 1991 to “make us aware of how modern society misuses the earth’s resources”. According to Hultin, on site composting would ensure we better understand the grow-eat-grow cycle. There are now Big Hannas all round the world: at the French research station Port-aux-Francais on the tiny Kerguelen Islands in the Pacific Ocean, on Sweden’s highest mountain, Kebnekaise, at a large military base on New Zealand, in around 50 prisons in England and numerous prisons in Ohio, USA, where they are also now part of rehabilitation programs. 1: Tin-Tin Jersild and Niklas Karlsson at Rosendals Trädgård. Big Hanna composting machine contains ABB machine safety products and has become an essential part of recycling and organic farming work. All food waste is pre-composted for soil enrichment. 2: ABB safety products ensure machine safety. It is absolutely impossible to start the machine until the Eden safety sensor has sent the all clear signal. 3: The temperature can reach 62 or even sometimes 63 degrees inside the machine, as microorganisms help break down old bread, potatoes and egg shell. 4-5: Niklas Karlsson, head of the kitchen garden at Rosendals Trädgård, is passionate about recycling, composting and ecology. 5: Tin-Tin Jersild, head of operations at Rosendals Trädgård, with a container of food waste that is about to be emptied into Big Hanna. “The machine helps us to avoid consuming more resources than our operations produce,” she says. 6: Rosendals Trädgård had a Big Hanna model T-240 installed. 7: Rosendals Trädgård dates back to the 17th century. The farm has 100 fruit trees, including several ones over 150 years old, 144 different kinds of vegetable and if you include sub species, there are “easily a thousand vegetables” in the words of Niklas Karlsson. Big Hanna is a composting machine that converts food waste into compost and helps reduce greenhouse gas emissions. ABB safety products ensure machine safety. When compost systems manufacturer Susteco AB wanted to integrate an effective safety system, they chose Pluto-PLC from ABB where the components communicate with each other. “The system ensures people who use Big Hanna feel perfectly safe,” says Cecilia Ek, sales director at Susteco AB. Machine safety is not only important for anyone who operates the machinery, it is also important for efficiency, as it reduces wear and tear and ensures a longer life span for the equipment. ABB is the world leader in machine safety and more and more companies are choosing the ABB integrated safety sensor Eden. “When you work with Big Hanna you can focus entirely on what is going on inside the machine without have to think about safety. Its flexibility means you can work in various different ways and concentrate on the work you are doing without the slightest concern about the machine,” says Ek. The Pluto safety PLC is the “brain” that can manage different types of safety sensor. In the case of Big Hanna, the Eden concept, also from ABB, was chosen. In addition to having a high enclosure class for outdoor use, the Eden non-contact sensor provides greater scope in managing the mechanical design of hatches. Compared to the sensor previously used, it has three times greater tolerance. Pluto not only checks the hatches, it stops the machine from operating if a hatch is opened. “It is absolutely impossible to start the machine until Eden has sent the all clear signal,” says Harald Estving at Elektro Part AB, who did all the programming. Between them, ABB and Elektro Part AB worked out an optimum solution that was then presented to Susteco. Estving was responsible for the programming and ABB produced a CAD sketch showing a modular system where you can add more and more hatches if required. “The Pluto safety-PLC is a new generation of control systems that are twice as safe,” says Estving. * ABB has installed its Pluto safety system including its Eden safety sensor that consists of components Adam and Eva. The Pluto safety PLC sends a coded signal to Adam and when the hatch is closed, Eva makes contact with Adam that then sends the coded signal on to Pluto that the system is safe and secure. * ABB and systems integrator Elektro Part AB chose to update to a more modern, flexible and modular system with Pluto and Eden from older safety relays, with safety sensor JSNY7 in Big Hanna at Rosendals Trädgård. * Pluto and the number of Edens are customized to customer requirements, in the case of Big Hanna, the number of hatches. In Sweden it´s still cold, gardening and cultivation is but a dream, but in Italy spring is in the air. Our partners in Italy, the Achab Group, welcomes spring by honouring Big Hanna and local composting. We gladly like to share their words with all of you. Soon spring will reach both Sweden and the British Islands. The snow is melting in the northern parts of Italy and further south the first plants are beginning to grow. Nature is waking up after winter and all growing things need to be nurtured. What could possibly be better than compost produced by the Big Hanna? Local composting is an ideal solution for small and middle sized municipalities or neighborhoods that are far away from waste recycling facilities or lack large scale compost facilities. With a Big Hanna organic waste is easily managed and useful compost is easily produced. 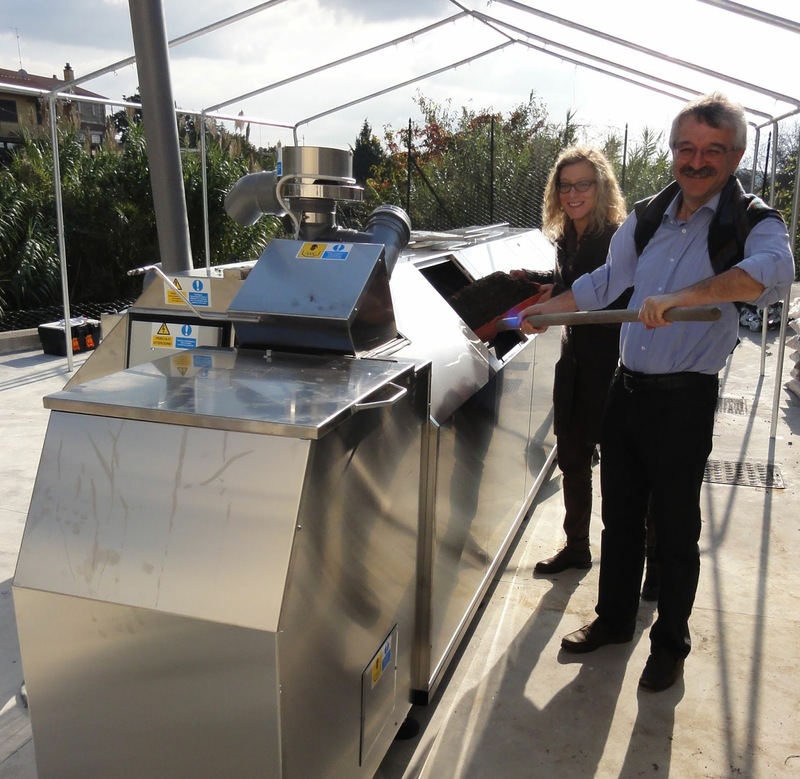 All the way from Valle d’Aosta on the northern border towards Switzerland, along the Mediterranean Sea to the west and Adriatic Sea to the east, as far as the southeastern tip and across to Sicily they appreciate the advantage of local composting. At 32 different locations we have installed a Big Hanna which turn organic waste into nurturing soil. The process decrease the CO2 emissions since fewer transports are needed and locally produced compost fertilises local agriculture and gardens. In cooperation with the Achab Group we have installed Big Hannas, trained staff and spread our conviction that local composting is the best way to recycle organic waste and create a better environment both locally and globally. Fewer emissions and a healthy soil.